Does anyone else have memories from this era which they can share with us ? Please contact us with them – they are always appreciated. Many thanks to Gordon Roberts who provides our Leominster News extracts! With snow falling and freezing weather what better than to browse through some editions of the Leominster News for the Autumn of 1919 and see what the Kingsland folk were up to nearly one hundred years ago and only a year after the end of the Great War. Life was getting back to normal and annual events such as the Foal Show with prizes totalling £38 was held for the first time since 1914. The cricket club reported a most successful season winning nine of their games, losing four and drawing just one. In one match against Kington, both the Rev James Jobling and his son the Rev. George Jobling played – more on these two churchmen at a later date. The football team joined the North Herefordshire League with their first match against Wigmore. It seems the old rivalry with Leominster was renewed and in one match, Kingsland accused Leominster of having an unregistered player, none other than Rev.W.W. Ayres. They submitted an appeal which they won, but both teams were reprimanded for their behaviour and the appeals committee said that if any further grievances were brought to their attention, both teams would be suspended. Public dances were in full swing again and the Croase Room was much in demand. The dances were in aid of village organisations such the Football Club the School and the Nursing Association. The events were held on Wednesdays which is hard to understand and started at 8.00pm and didn’t finish until a stamina testing time of 3.00am. Tickets were usually priced at two shillings and sixpence which is twelve and a half pence in today’s money. On September 19th, there was an important wedding at the Church which the paper reports under the headline of ‘Pretty Wedding’. It joined two of the prominent farming dynasties in the village, the Price family of St. Mary’s and the Williams of Holgate. The paper goes on the report that Miss Fanny Price only daughter of Mr. and Mrs. Price married Albert Henry Williams, only son of Mrs. H Williams and the late Mr. Henry Williams. The guests consisted of members of the village farming community who were quire generous in their gifts of silverware. Mr, R.H.George of Croftmead remained active selling local properties including the Lion Inn for £1,000 Brook Farm for £2,300 and a farm on the outskirts of the Parish with 173 acres, three cottages, a large farmhouse and outbuildings all for £12,300 The family who bought the farm then, still farm it today. The same Mr. George handed over the Bungalow on very generous terms to the Kingsland Post of the Comrades of the Great War, but unfortunately it burned down in the 1940’s. The end of the Great War was commemorated at the Church on November 11th and names of those who had been killed in the war were read out. A signal to stop work for two minutes was given by the siren at the timber yard next to the station. Messages appeared in the paper of sons lost in the war including one for Sergeant Stephens which reads “sadly missed by his loving Father and Mother, Brother and Sisters, Brick House Kingsland. Another reads “In ever loving memory of Private John Abberly of Brook Bridge Kingsland who was killed in action aged twenty. Ever remembered by Mother and Father Brothers and Sisters”. The Wesleyan Methodist Chapel at their Harvest Festival, presented a testimonial to Mr Samuel Small for his sixty years of devoted service to the Methodist cause in Kingsland. He was later to be buried in the grounds of the Chapel where the grave of he and his wife can still be seen to this day, The village Bobby, PC Hardwick, seemed to have nothing better to do than catching people without lights on their bicycles. The miscreants had to appear before Leominster Magistrates Court where they were usually fined five shillings. He even refused to overlook one of these, a wretched Lucton schoolboy on his way home from school. The Agricultural Labourers hours were fixed at fifty hours in the summer(reduced from fifty-four) and winter hours at forty-eight. And finally, Mr. H.J.Pritchard was pleased to announce that he has set up a horse slaughtering business at Broomy Hill. The death of Evan Dyke of The Laurels aged 84 years was announced. Before coming to live in Kingsland, he farmed at The Rhodd, The Woodhouse and at Leinthall Starkes. A meeting of the Sports Committee was held at the School. Among others present was Mr. A. J. Harding and Dr. D. C. Vaughan. It was agreed, after the accounts were presented that £100 should be presented to The Welcome Home Fund and £28 to the Kingsland Sports Fund. It was unanimously agreed to hold the Sports Day annually. There was a meeting of the Kingsland Parochial Council presided over by Preb. Jobling. A vote of thanks was given to Colonel J. Coates for safeguarding the valuable stained glass window at Eyton Hall during the war. It will be returned and refitted after some repairs to the tracery and some releading. There was a fete at the Rectory and Capt. A. J. Mellor who presided over the opening ceremony as Chairman of the Committee, said he wanted to raise the Welcome Home Fund to £1040. Mrs Jobling said that she and the Rector welcomed everybody to the Rectory. The fete consisted of many stalls such as lucky dip, produce, white elephant, cakes, jumble etc. There were pony rides and a produce competition, dancing and music. In closing, Mrs Jobling said that the fund’s target would be reached and reminded everyone that the service men and women would soon be arriving home. She wished everyone a bumper harvest. There was a Service of Thanksgiving in the church on Wednesday evening, the war having finally ended. It was conducted by the Rector, Preb. Jobling before a full congregation. On Thursday, there were bonfires and dancing in the street which was much enjoyed by all. On Friday, the school children were given an excellent tea followed by a programme of events on The Greens. In the evening, there was a Whist Drive followed by some light entertainment until 10.30pm. On Saturday, there was dancing in the school and the yard until 1.00am to the strains of music from a radiogram. Expenses were met from donations and a balance of three pounds and fifteen shillings was handed over to the Welcome Home Fund. Finally, on Sunday, the services at the church were honoured as a Festival Day and part of the collection was given to the Archbishop’s Aid to China Fund. The Kingsland Sports Day held on August 6th on the Greens was an outstanding success. The whole village participated in one or another. Mr. T Wall and Mr. CT Jones acted as the starters. Dr. D C Vaughan and Mr. A H Williams arranged the events. Preb Jobling and Alderman Langford were the judges. Mr John Morgan was the announcer. Messrs. R Smith, J Hobbs, R. Jones and H. Gunthorpe were gate stewards. About 400 teas were served in the school by the ladies committee. Among the results of the races were – Boys 7 years to 10 years. First Kenyon Jones, second Gordon Roberts, third Bob Bodenham, Girls 10 years to 14 years. First Dorothy Baker, second Ethel Roberts, third Ruth Morgan. The rainfall for July in the village was 3.31 inches. It was announced that Kingsland Sports Day would be held on the Greens for the first time since the outbreak of the war. It would take place on Bank Holiday Monday the 6th of August with an opening ceremony by Mrs G. C. Phillips of Street Court. Admission prices would be one shilling for adults and three pence for children. It would be followed by a dance in the school at 9.00pm. There would be flat races for children and adults. Also an egg and spoon race, sack and novelty races, an obstacle race and a slow cycle competition also Tug of War and side shows. Proceeds would go to the Local Comforts and Welcome Home Fund. Members of the National Fire Service paraded in Kingsland to bid farewell to Column Officer Pow. Section Leader Mr. A H Williams and Preb. Jobling expressed gratitude to officer Pow for all the work he has done. He is being transferred to Hereford. The monthly meeting of the Women’s Institute was held at the school. Mrs Lawson Perry gave a talk on ideas for a fancy gift stall and showed some very nice things which she had made. There was a competition for a trifle and the winners were Miss Evans and Miss Karlsson. There was a social half hour which was thoroughly enjoyed. The hostesses were Miss Godfrey and Misses E and K Goodman. The Produce Association visited Shrublands gardens by kind permission of Mrs Bartholomew. Mr Leslie Pugh, only son of Mr. and Mrs. Pugh of Stoneleigh Kingsland died in the Queen Elisabeth Hospital Birmingham. The Chapter of the Rural Deanery held a meeting at Kingsland Rectory to make a presentation of Dr. Temple’s work on St. John’s Gospel to the Rev. Preb. W. G. Moeran, the former Rural Dean who has been appointed to the living of Ledbury. Preb. Moeran is succeeded as the Rural Dean by the Vicar of Kingsland, Preb. G. H. Jobling. Flanagan and Allen in “Dreaming” was the film at the Clifton Cinema in Leominster for three days from 9th July. The supporting film was Sidney Toler in “Black Magic”. Knockout, limited over cricket in the evenings was resumed on the Grange in Leominster after a break because of the war. A team from Kingsland entered the competition along with the Nondescripts, the Blue Boar and others. Kingsland’s rainfall figures for the month of June were 3.41 inches as recorded by Mrs Wheeler of Fairfield. The Produce Association had a very enjoyable experience when they journeyed to Marden to inspect the large acreage of glass for growing tomatoes and cucumbers. Between thirty and thirty-five members participated and they were accompanied by Mr. A E Crawley, an official of the County Association. The death of Private E A Jones is announced who was killed in a train crash in Southern France. He served in the Great War as well as the current war and was awaiting demobilisation. He was twice wounded in the Great War and his wife and children reside at Powis Row Cobnash. There was a Grand Concert at the Clifton Cinema in Leominster in aid of the Leominster Welcome Home Fund. The artistes were from London and the compere was Sergeant Coryell of the US Army. Seats, which were bookable at the offices of the Leominster Printing Co. Ltd. in Drapers Lane, were priced at ten shillings and six pence, and five shillings. Unreserved seats payable at the door, were three shillings and six pence or two shillings. With the forthcoming General Election on 5th July, there was a flurry of political activity by the two candidates Mr Archer Baldwin for the Conservatives and Mr A E Farr for the Liberals. Eve of poll meetings were announced by Mr Farr at Kington at 7.30pm and at Leominster at 8.30pm. With the usual foresight of Mr.and Mrs. Davies of the Angel Inn, a party from the RAF station at Shobdon gave a very entertaining concert at the village school in aid of the Welcome Home Fund. Special thanks was given to Mr. A W Bengry for the transportation of chairs and Mr Maurice Markham for the transportation of the RAF party. At the Women’s Institute, in celebration of VE day, a cake was given by the officers which was much enjoyed and the remaining portions were put up for auction in aid of the Welcome Home Fund. The Young Farmers Club had a debate on the benefits of grass farming or arable farming. The former was defended by John Price and Raymond Pugh and the latter by Arthur Morgan and Albert Davies. The voting favoured arable farming. Westons Cider Company advertised their cider as the “Wine of the West – Britain’s healthiest drink”. There was an advertisement on how residents of Kingsland should obtain their new Ration Books. They should go to the Bell House. The Anniversary services of the Baptist Chapel were held on June 3rd and June 4th and on Monday, the annual tea was held following a public meeting at which the Pastor, the Reverend J Ronald Harper preached to a full church. The visit of the Kingsland Produce Association to Fairfield, the home of Mr and Mrs Wheelock was postponed owing to the inclement weather. Mr Wheelock had measured the rainfall for April at 1.98 inches. A meeting of the Kerry Hill Flock Book was held at Shrewsbury. Miss Sheila Wenham of Brook Farm Kingsland, a notable breeder of Kerry Hill sheep, the newly elected Chairman presided. Miss Wenham was warmly congratulated on the able manner in which she carried out her duties as Chairman for the first time. The Shirlheath Methodist Chapel held it’s anniversary for the first time since 1939. There was a large congregation at the service where the speaker was Rev. Ward of Leominster and Rev, Hall also of Leominster. Friends from Kingsland Methodist Church and Kingsland Baptist Church attended in good numbers. At a meeting at the Corners Inn,it was decided not to hold the foal show this year which had been held on the Boarsfield in previous years. Members of the Young Farmers Club had a shearing class at St. Mary’s farm. The instructor was Mr. Davies of Monkland. Parliament was dissolved and Polling Day set for June 15th. Tommy Trinder was appearing at the Clifton Cinema, and later in the week, Irene Dunne in the White Cliffs of Dover. Photographs started to appear in the paper for the first time, mainly of weddings following the end of the war. Prisoners of War were returning home including Warrant Officer Walter Mitchell, son of Mr and Mrs Tom Mitchell of Park Terrace, Kingsland who bailed out of his aircraft during a raid over Hanover. Also, Fusilier J Preece son of Mr and Mrs Richard Preece of Lawtonbury. A football match was arranged between Kingsland and RAF Shobdon. A public meeting was held at the School to discuss the report of a committee authorised to explore the possibilities of sites and building for the proposed Parish Hall. Mr J Harding presided. Three sites were offered, one of them as a gift from Mr. Hamlen Williams on land known as Pope’s Orchard. A money target of £3,000 was agreed. A football match was played on the Boars Field by kind permission of Mr J. C. Price between Kingsland and Eardisland which the Kingsland team won by six goals to two. The referee was Mr Beard of Leominster. A Whist Drive was held by the newly formed Village Hall committee in aid of the Hall funds. Raymond Jones won the first prize of a cake and the second prize of a bottle of damsons went to Mr John James. The Service of Thanksgiving for the end of the war in Europe took place at the Church. There was a large gathering of people from all denominations. A parade assembled at the Fire Station marshalled by Mr C. T. Jones and marched to the Church behind the bugle ban of Lucton School. The children of the village were entertained as part of the VE celebrations and games of rounders and football were organised. Our Photograph shows the family group at The Bank, Kingsland, on Saturday, when Mr. and Mrs. Arnold Stephens celebrated their diamond wedding. Reading from left to right are Miss Joyce Crump, Miss Molly Crump (granddaughters), Mrs Stephens, Battle Cottage, Kingsland (daughter-in-law), Mr. D. Stephens, of Irby, Cheshire (son), Mr. and Mrs. A. Stephens, Mrs. Crump (daughter), Master Sonnie Crump (grandson), and Miss Elsie Stephens (granddaughter). Despite the fact that the weather on Saturday was not at all in keeping with such a happy event, Mr. and Mrs. Stephens spent a very pleasant day and were deeply touched by the spontaneous congratulations that were showered on them. These came by post and telegram in great numbers while many called at the Bank personally to express their pleasure on such a noteworthy occasion and to offer their best wishes. Mr. and Mrs. Stephens received various gifts of flowers, etc to mark the sixtieth anniversary of their wedding. Mr. Stephens was an old Kingsland bellringer and it was therefore most appropriate and very pleasing that a peal was rung on the Church bells in the evening. 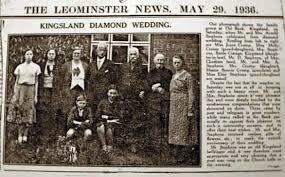 I am grateful to the Kingslandlife committee for allowing me to present on the website some extracts from old issues of the Leominster News. I will start with the first paper in 1945 which was numbered 3336 Volume 65 suggesting the paper was founded in the 1880′s. The price was 2d or tuppence in old money. Village life in Kingsland wasn’t anything to laugh about in those days with many restrictions and regulations caused by the war. Low farm wages and the poor quality of the tied cottages typical of an agricultural community, added to the problem. Now that life in the village nearly seventy years later has changed so much, we can look back on the “good old days” with some amusement and have a quiet chuckle at the expense of a previous generation and read how they went about village life as reported in the Leominster News. April 1945: The death of Mr Arthur Francis Durdle of Park House was reported. He died at the early age of 34 years and his death was learned with great sadness in the village. He was a very popular personality and a very good sportsman. He joined in many of the village activities. The Great Anglo American Circus and Menagerie visited the White Lion Field in Leominster on April 24th 1946. A whist drive was held at Kingsland School in aid of the Welcome Home Fund with Mr J. Morgan as MC. The ladies prizewinners were Mrs Bowen, Mrs Meredith and Mrs Southam. Gentlemen prizewinners were Aircraftman J. M. Rule, Mrs A. H. Williams playing as a Gentleman, and Sergeant Booth. There were 23 tables. From April 23rd, Margaret Lockwood appeared at the Clifton Cinema in Love Story and from Thursday April 26th, Van Johnson and June Allyson appeared in Two Girls and a Sailor. The late President Roosevelt was embodied in the morning service at the Parish Church in accordance with the desire of the Government. A muffled peel of the Church bells was rung at 12.15pm. March 1945: A meeting of the war comforts fund was held at the Bell with Mr G. C. Phillips of Street Court in the chair. The purpose of the fund is to provide warm clothing, largely knitted in the home, books and food parcels and so on to the men and women in the fighting services. A conscientious objector was given three months hard labour. Robert Morrow of the High Street Leominster advertised seeds for the garden and flower bed. A film starring Abbott and Costello was being shown at the Clifton Cinema which was a rare opportunity for children to go to the cinema unaccompanied by an adult. Later in the week, Jon Hall and Maria Montez were due to appear in a film called Gypsy Wildcat. A talk was given at a meeting of the Kingsland Womens’ Institute by Mr Gibson of Hereford County Council on planning a village hall. How prescient was that. In 1944, Kingsland raised £519 pounds for war charities, a large amount in those days. For the first time, the results of the North Hereford Air Gun League which had been reconstituted as the war was coming to an end, were reported. Kingsland beat Ivington and the Kingsland team consisted of Messrs. Sankey, Evans, Langford, Reynolds, Preece and Bodenham. There was a dance at Kingsland school organised by the Fire Service in aid of the A. F. S. Benevolent Fund. The attendance was 180 and the sum of twenty-five pounds, ten shillings and fourpence was sent to the Fund. Music as provided by the N. F. S. band from Worcester. The sacred concert held at the Baptist Chapel which was performed three weeks earlier was repeated with much the same production as before. This was probably because the weather was wintry on the first occasion and more people wanted to attend the concert than could be accommodated the first time. A German prisoner of war escaped from a train whilst being escorted but was recaptured later when he gave himself up. The paper carried advertisements from Leominster businesses for Scottish seed potatoes by J. L. Hinton and Son, Timber and building products by Charles Norgrove Ltd. and Wainwright and Williams for Ladies and Gents Tailors and at last there was a “U” rated film at the Clifton Cinema starring Roddy McDowell and Donald Crisp with “Lassie Come Home” which enables children under the age of fourteen without being accompanied. February 1945: There was a fire in a building close to the Kingsland sawmills. A tractor backfired and set alight some oily rags.The building was gutted but Leominster Fire Service were quickly on the scene and prevented the fire from spreading to the sawmills. At Leominster County Magistrates Court, a Kingsland businessman was charged with making a false statement in order to obtain a licence to kill a pig. The matter was considered quite serious and deserving of a prison sentence and/or a fine of £100. but in the end a fine of £4 was imposed with costs of £4 14s 6d. There was a dance at the school in aid of the Navy Depot for knitted garments. Music was provided by Mr. Naish’s radiogram and £3 was sent to the Navy Depot after expenses. The Kingsland Produce Association held it’s monthly meeting. The association was formed to support the “Dig for victory” scheme as part of the War Effort. February 1945: The Annual Sacred Concert was held at the Baptist Chapel. The Chapel was full despite the bad weather. The sum of £10 was donated to the Merchant Navy Comforts Fund. Compositions such as “Bless This House”, “Holy City”. “The 23rd Psalm”, and “Nearer my God to Thee” were rendered by local people such as Mr. Lloyd, Mr John James and the Jones family. The Home Guard who have now been demobilised agreed under the chair of Mr. J Morgan to turn over the entire proceeds of their welfare fund to the Welcome Home Fund which amounted to £15. A whist drive took place in aid of the Welcome Home Fund which realised £8. The lady prizewinners were Mrs Tomkins, Miss Molly Crump and Mrs Hardy. The gentlemen prize winners were Mr Brian Morris, Mr F Durdle and Mrs Crump playing as a gentleman. The Leominster News for the early part of 1945 gives the impression that life in Kingsland seemed to go on in the usual unhurried way, growing food for the nation and fostering a community spirit as war still raged over the English Channel. Reports in the paper of young men receiving awards for gallantry or being tragically killed were reminders that the war was not yet over. The paper was published on Fridays from its premises at 27 Drapers Lane, Leominster. Copies for distribution in Kingsland arrived on Bengry’s bus just after 6.00pm on Thursday evenings and were distributed right away around the village by Mr Percy Edwards of the Bell. Much of the news in the paper about Kingsland reported social events such as dances, whist drives and concerts in aid of wartime charities which were part of the War Effort. In 1944 the village contributed over £500 to the wartime charities which was a very large amount in those days. The paper also reported, in some detail, cases which came before the Magistrates Court (more on this later). There was a whist drive at Kingsland school for the Wellcome Home Fund with eighteen tables and Mr J. Morgan was the M.C. £11 was sent to the Fund. The children at the school had an enjoyable breaking up party (not withstanding the food rationing and your Contributor would almost certainly have been present). Advertisement for Harrison Barber, Licensed Horse Slaughterers of Broomy Hill Kingsland. Advertisement for Gradely Foot Paste, for people who suffer from corns, callouses, hard skin, warts and ingrowing toenails. Danny Kaye and Dana Andrews were appearing in “Up in Arms” at the Clifton Cinema in Leominster. Recent extracts from old editions of the Leominster News published on this website mention the Clifton Cinema in Leominster. Before television it was an important outlet for entertainment and a valuable source of news as shown in the newsreels. The cinema opened in 1936 on land made available by the demolition of imposing buildings at 28 and 30 South Street. It was a mecca for young people and families from Kingsland and was extremely popular before television came to the village in 1949 with the opening of the BBC’s second transmitter at Sutton Coalfield. So many people went to the cinema, or “to the pictures” as it was commonly called, that queues would form outside the cinema especially on Friday and Saturday nights. The programme consisted of a main film with a shorter supporting film, a newsreel usually Movietone News, perhaps some cartoons and trailers for the upcoming films. The programme would run continuously from mid afternoon so that it was very difficult to know at what time the next showing of the main film would commence. Consequently, it was quite usual to go into the cinema at any time, even during the main film and disturbing those already in their seats. The usherette would shine her torch on the vacant seats which might be in the middle of an otherwise full row. Having taken your seat midway through the film, you would then stay until the same point in the film came around again. The air inside the cinema would be full of cigarette smoke and the beam of light from the projector at the back of the cinema, stood out clearly through the cloud of smoke. Admission prices were from sixpence for the front stalls to two shillings for the rear stalls. The back row was utopia for courting couples and much in demand. The programme changed twice a week and where the film was rated A, children under sixteen years of age could only go in if they were accompanied by an adult. It was common practice for children under sixteen to ask complete strangers if they could go in with them. There were programmes just for children on Saturday mornings. The cinema was closed on Sundays. The programme ended each night with the National Anthem and even before it was over, there was a mad scramble to catch the last bus to Kingsland at 10.00pm. On most Saturday nights, there had to be a relief bus. The cinema was occasionally used for other purposes including the Speech Day of the Grammar School and perhaps a special showing for the pupils of the latest Olivier Shakespearean film. It closed in the 1960′s, a victim of television and has since been used for bingo.